Nuevos Ministerios is the northern limit of what we would call the center of Madrid, which would lie within the #6 Circular Metro Line (see interactive map). Through Nuevos Ministerios goes the “Paseo de la Castellana”, the major axis of Madrid, which goes South to North and links Nuevos Ministerios to Plaza Castilla, Chamartin train station and its neighbourhood. Plainly put, this business focused neighbourhood organizes itself around the Castellana (look on the interactive map). The closer you are to the Castellana, the more business focused your surroundings will be: tall buildings, offices, car parks, malls and shops for corporate people, restaurants full at midday and empty at night. The furthest you go west or east from the Castellana, the more residential your surrounding will be: smaller buildings, all flats for families, couples and singles, local shops. Let’s say that if you work on the Castellana, a good idea can be to live 15 minutes west or east from your work. If you go east, prices will rise quickly since you are getting closer to the upscale Salamanca neighbourhood. If you go West and North, you will find cheaper rentals and properties. quiet out of working hours since it is so business oriented. It is a great neighbourhood to live in if you work there. Especially if you prefer quiet and practical neighbourhoods over nightlife. It’s also very practical if you travel a lot since the airport is only a 10 minute drive away or only 12 minutes on the new direct train from Chamartin. – want to be connected to the center of Madrid. 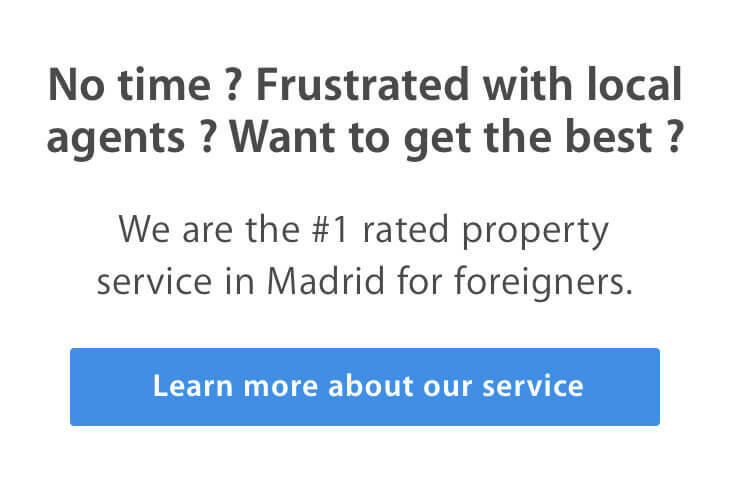 – work in the same neighborhood, or around the Castellana. – prefer to be in a quiet neighborhood, with little nightlife, but with restaurants and bars. When flathunting in the Nuevos Ministerios and Chamartin neighborhood, do complete the classic checks I explained in the “10 flathunting tips” post.